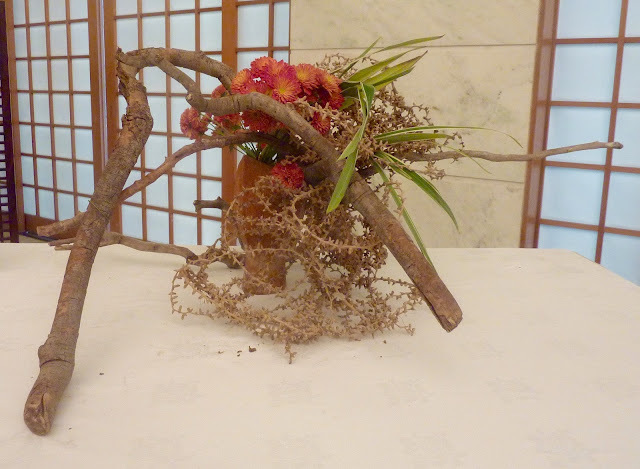 Our November workshop was an unusual one. 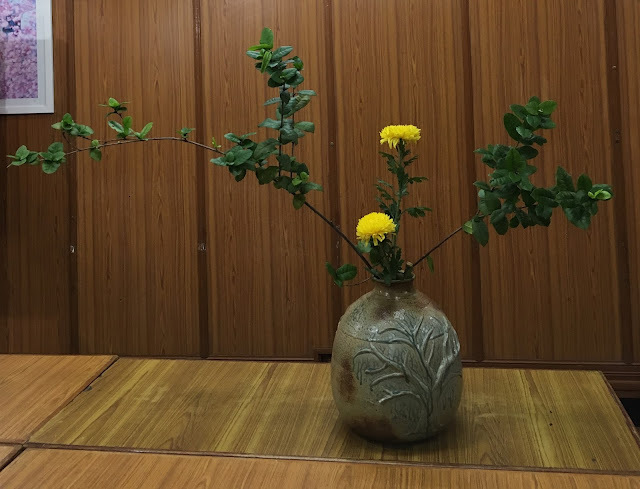 While we work so hard as a Study Group to create Ikebana with various inspirations, what about the containers that we use? 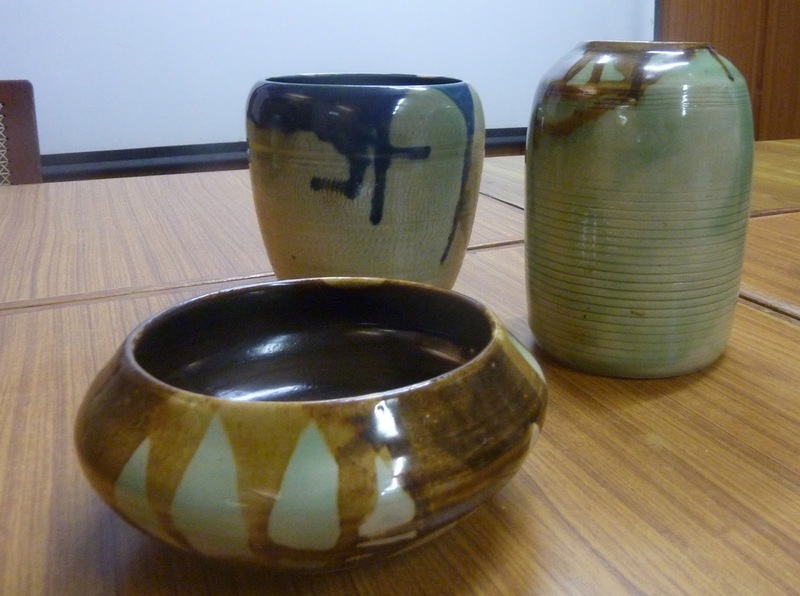 What can we learn from the allied art of studio pottery? Could we use the workshop to highlight unusual containers? 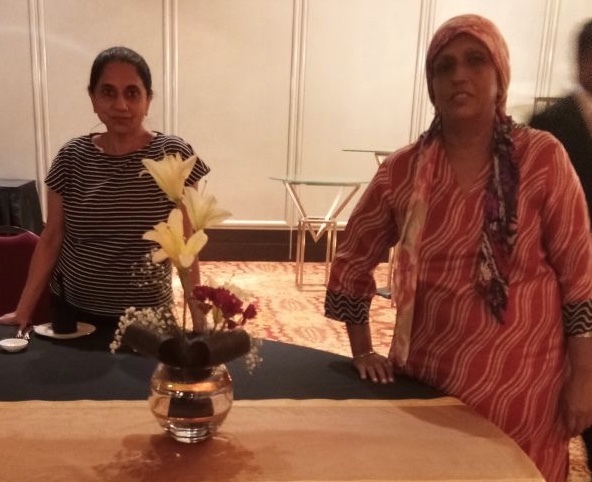 Mrs Sandhya Ravi Shankar, a potter who has studied at Sanskriti - Delhi Blue Ceramic Centre, shared with us her journey and learnings in the exciting world of working with stoneware, and the process of creation and the element of the unexpected and the imperfections. 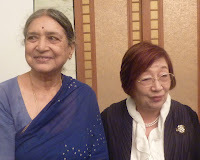 Ten of the Study Group members were present. 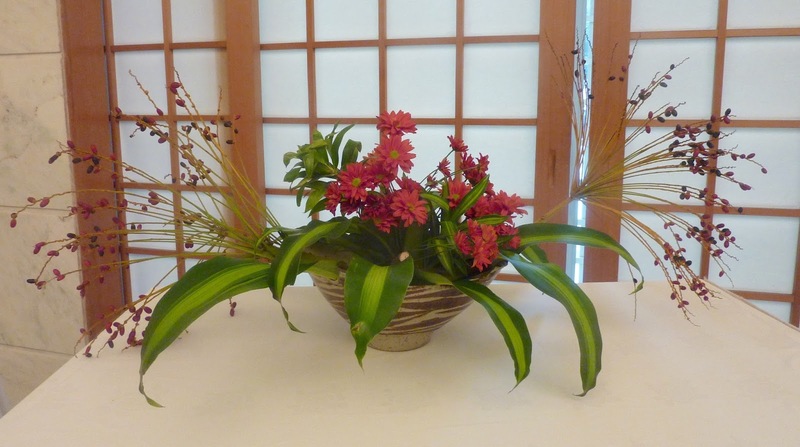 Originally scheduled for the 15th, it was re-scheduled due to the forecast of heavy rains. 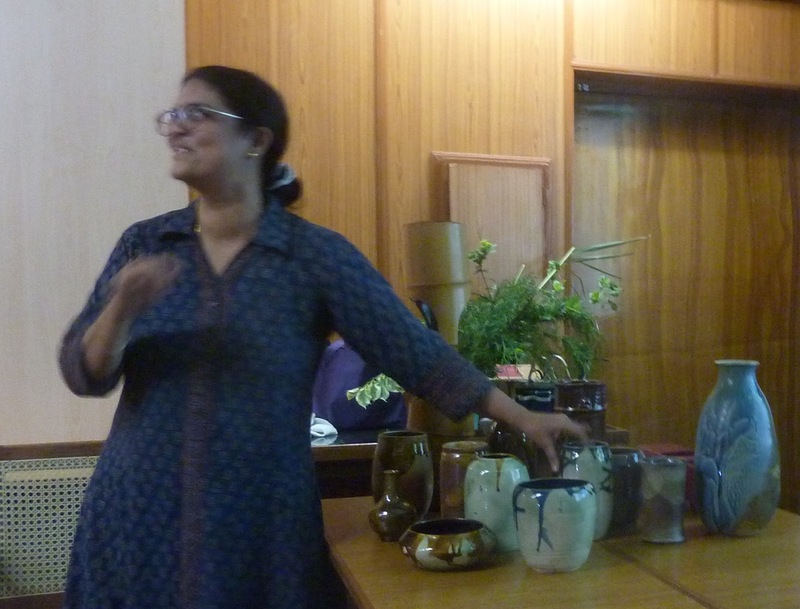 Sandhya took us through an absorbing talk, speaking about the historical and cultural role that pottery has played, across the world, and the various kinds of pottery, from terracotta to stoneware to porcelain. She also shared the experiences and challenges of a potter's life, which while being physically demanding, also is creatively rewarding. 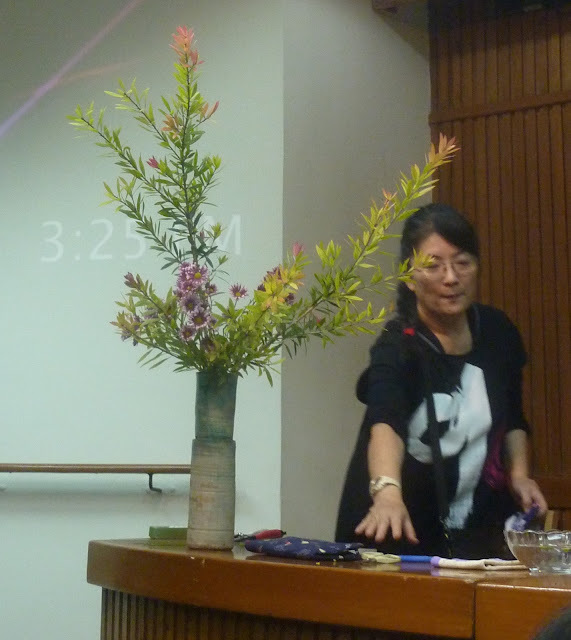 She shared with us some of her creations and the various techniques used. 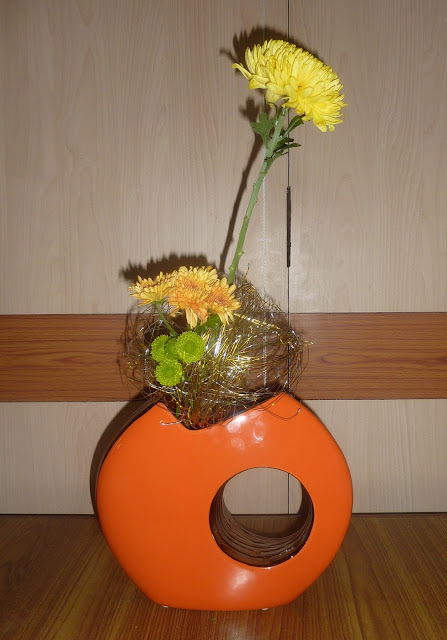 Using the coil and throw process , with carving om the surface resulted in this beautiful piece. Taller and larger pieces are of course more challenging and require more skill, practise and experience. 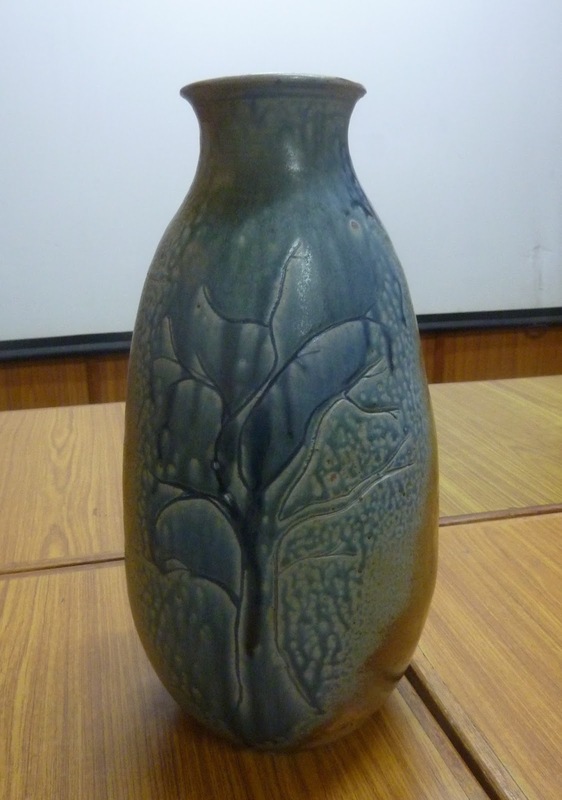 Another example of the coil and throw process with bas relief work. Sandhya commented that the two "trees" could be interpreted as hands grasping at a fragile world. 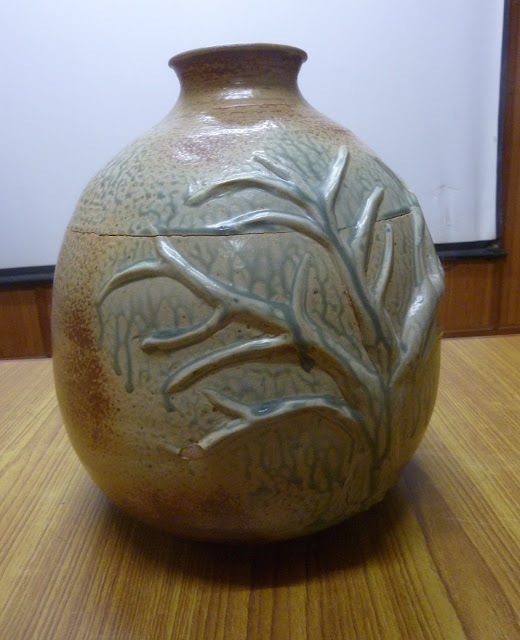 Sandhya also spent some time elaborating on the process of glaze firing which renders the clay into strong, non-porous ceramic objects that outlive the artist! 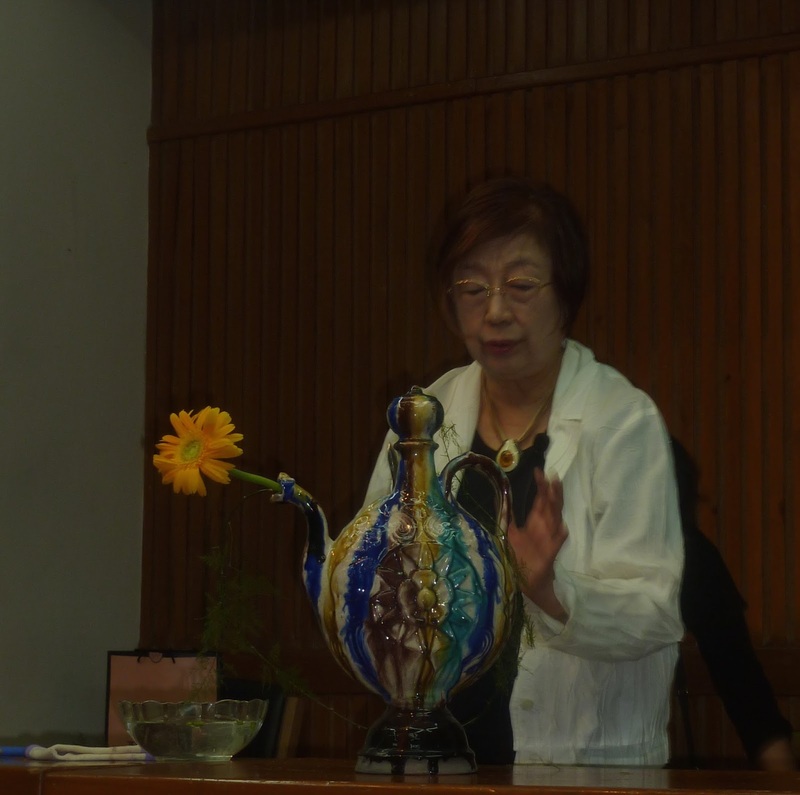 The lesson to students, she said was to be sure before putting creations into the kiln because once fired, it cannot be undone! The firing would sometimes crack poorly made pots, but is is full of amazing uncertainties. She showcased some of the glaze effects obtained using oxides of iron, nickel, copper & cobalt in an oxidising kiln environment. 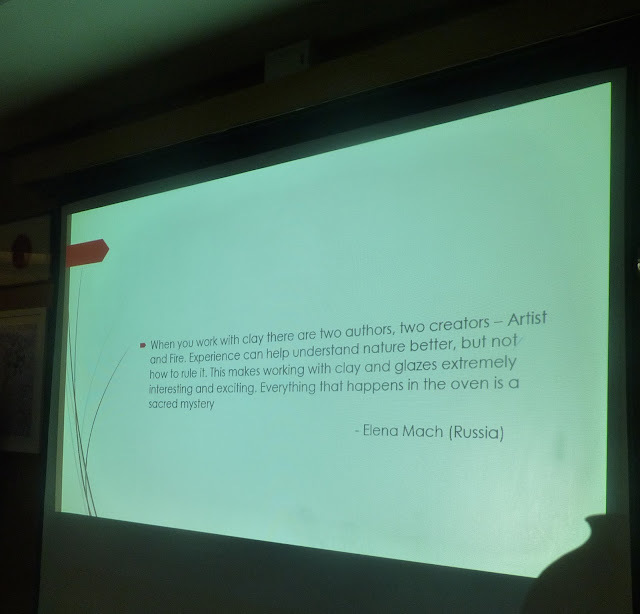 She ended her presentation with these very appropriate lines regarding the artist and the process. 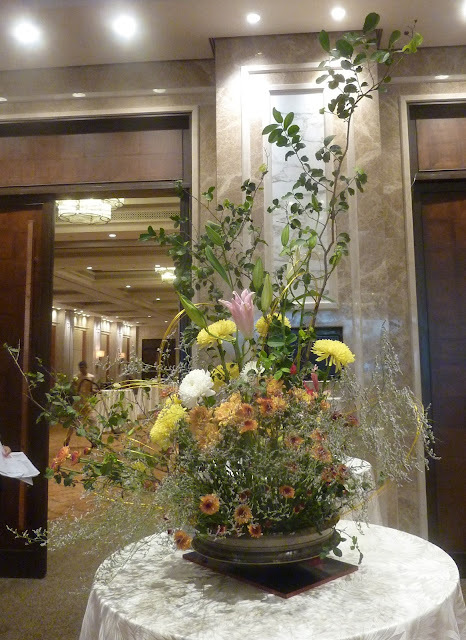 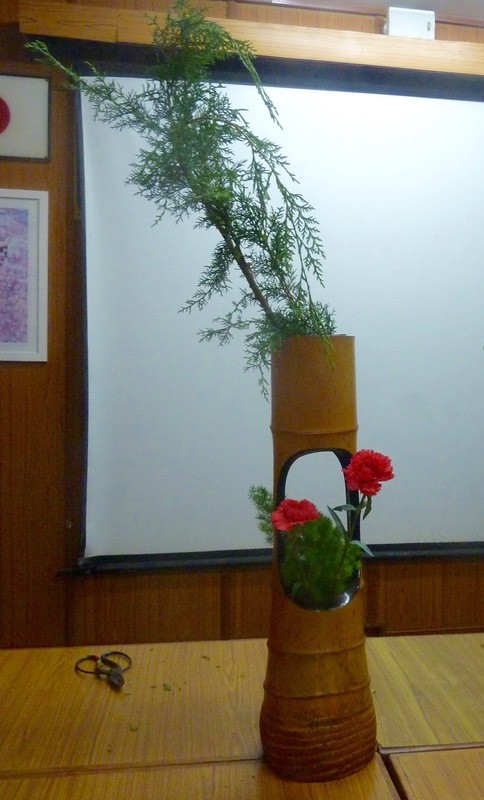 Malathi sensei then responded to the large vase with the tree. 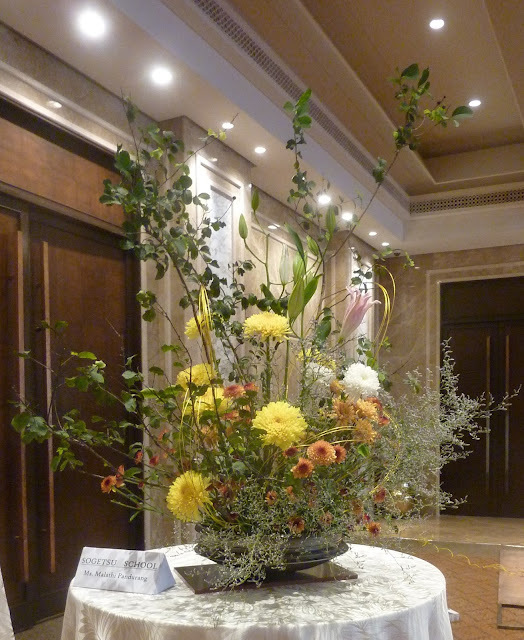 Using wide expansive lines of Ixora to create an artistic space, Malathi sensei then used two large chrysanthemums for a naturalistic expression. 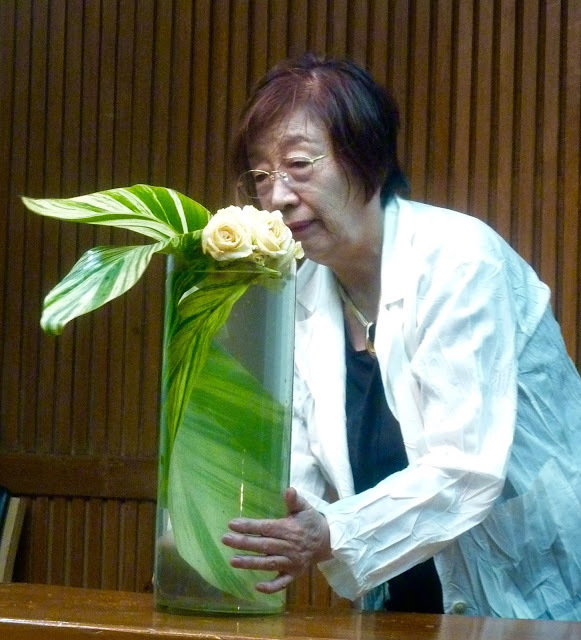 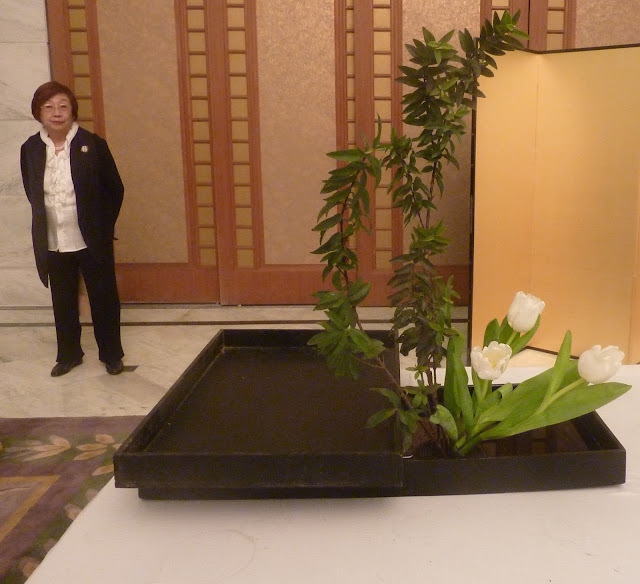 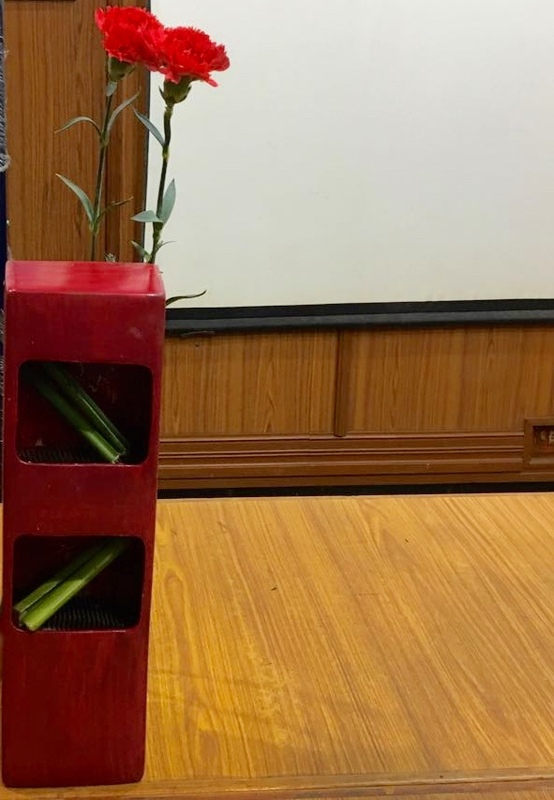 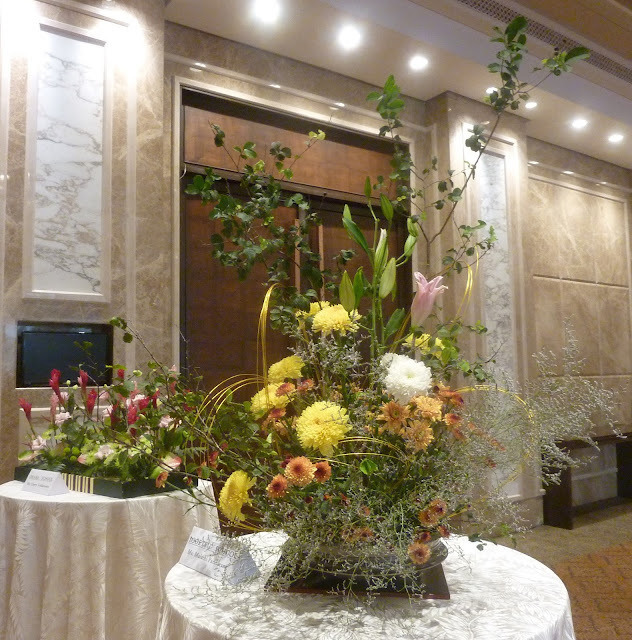 Malathi then spoke about this Japanese traditional Ikebana bamboo container. She reminisced as to her experience in purchasing it in Japan, and how she has cared for it in the humidity of Chennai, following the instructions of the shopkeeper! 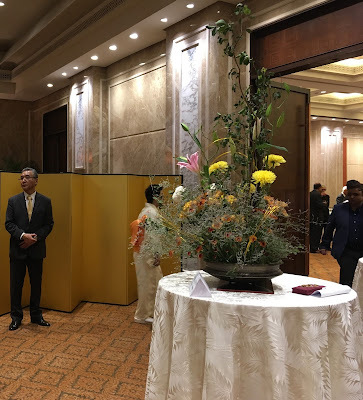 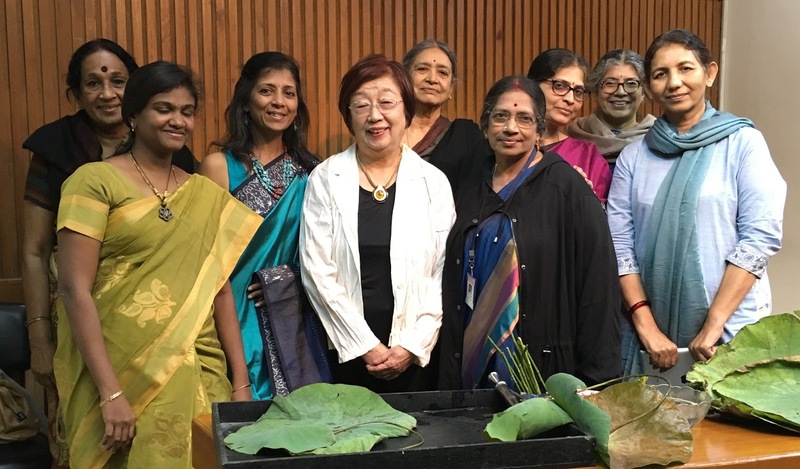 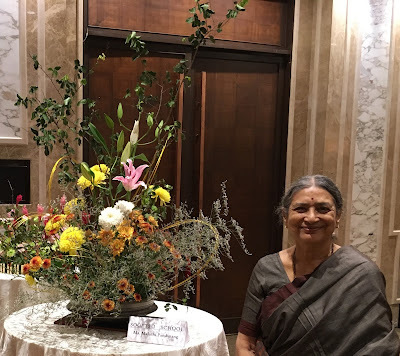 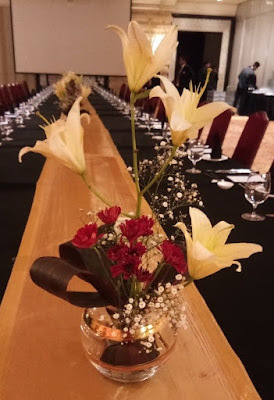 Using a pine with a downward movement in the upper space and carnations moving upwards, Malathi sensei connected the creative spaces in a composition that brought the Japanese tokonama into our minds. 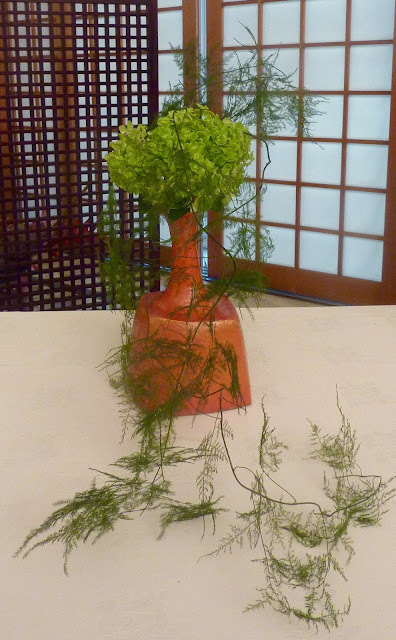 This was contrasted by a modern abstract expression, to complement the modern Sogetsu ceramic vase. 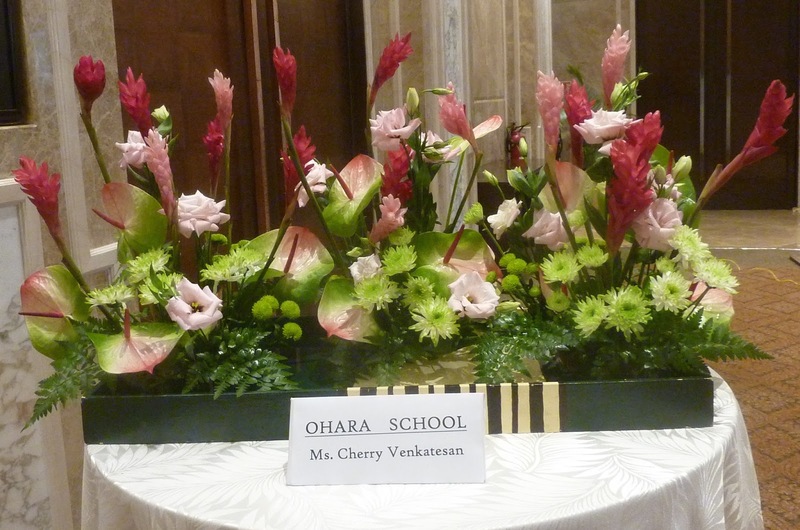 Using it vertically to create two "windows", Malathi sensei created green lines that zig zag up and end in the carnations that reflect the colour of the vase. 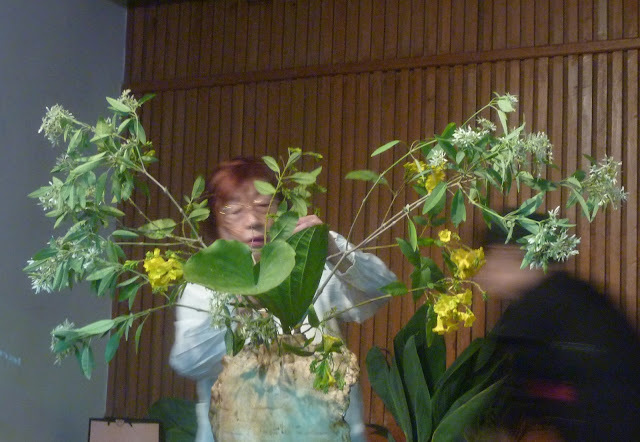 All the three compositions. Unusual containers all, with differing emotional expressions. Chelvi created her own container, using decoupage on a wine bottle, and the pink roses and the long black lines complemented them perfectly. 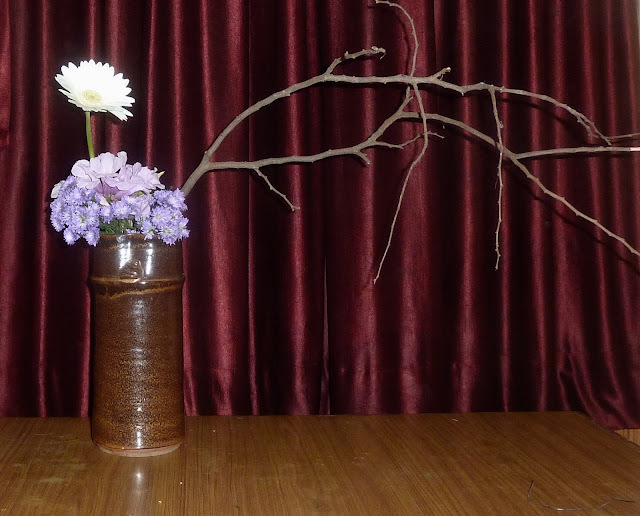 Janaki highlighted the "twisting" surface of her vase, in the composition with seed pods, jerbera and michaelmas daisies. 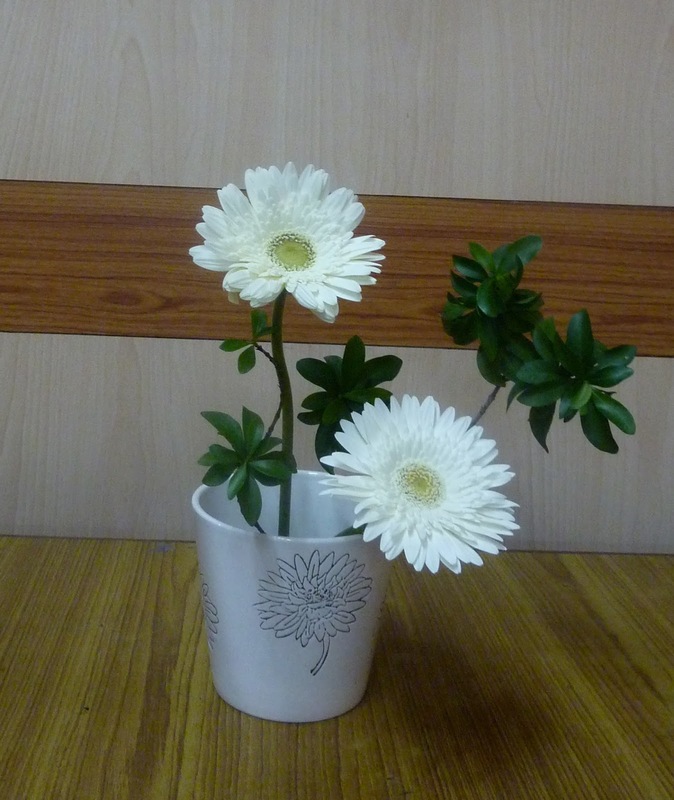 For Bhuvana, the unusual pot inspired a miniaturised arrangement with jerberas. Molly sensei displayed her two-toned ceramic nagiere vase with tall lines that kept the vase in focus. 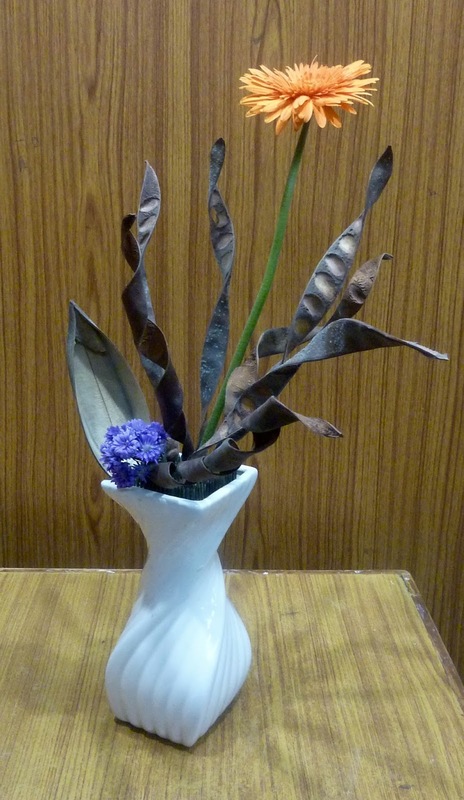 Chitra Rajan used a ceramic vase from Potters Shed. She chose to create an end of monsoon season feel, with the bare branches symbolising the fallen leaves and the fresh clematis flowers and small purple chrysanthemums in a bunch with money plant leaves depicted the renewal, in this expression of wabi sabi. 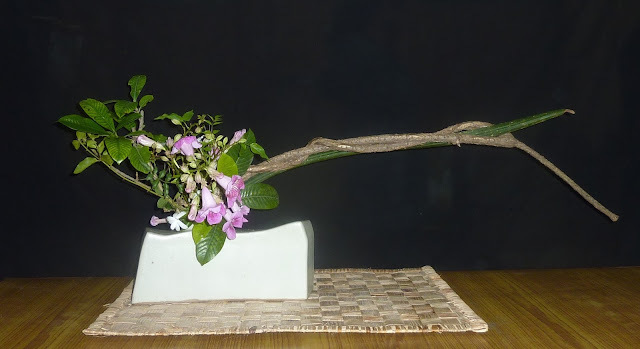 The white jerbera brought balance to the composition. 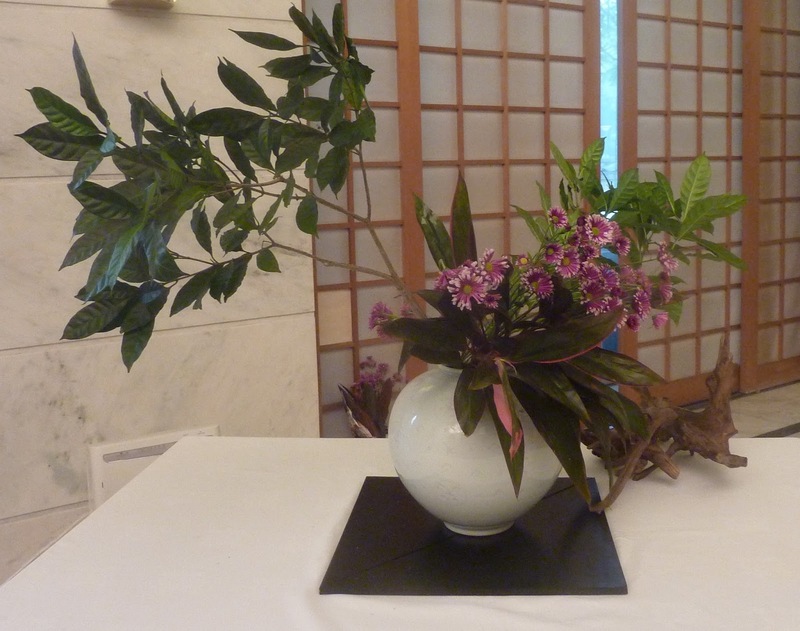 The unusual container could be imagined as a tree trunk in the nagiere composition. 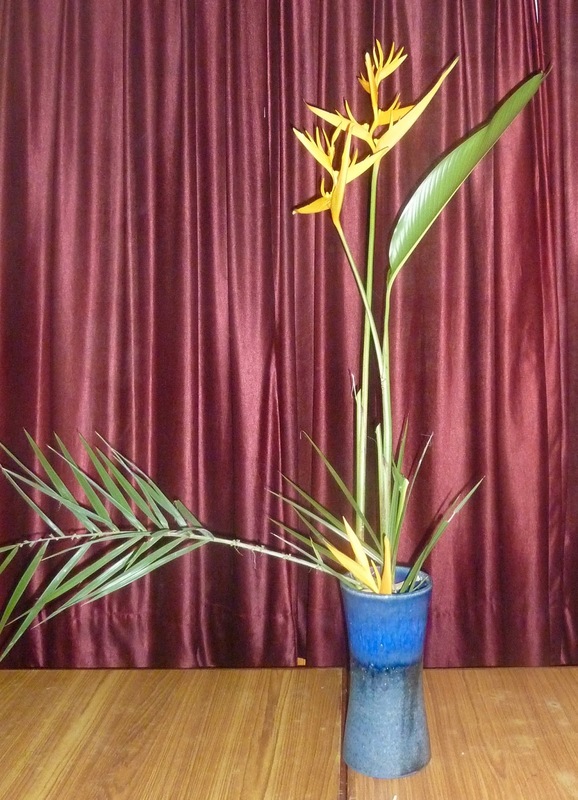 Sensei Prerana looked to emphasise the shape and colour of this gold and orange container. 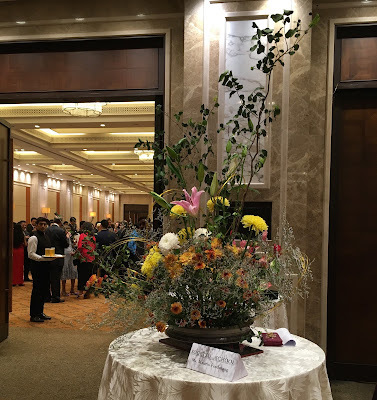 Gold mesh, green and orange miniature chrysanthemums in a circular arrangement mirrored the circular hole of the container while the yellow chrysanthemum brought height and balance to the composition. 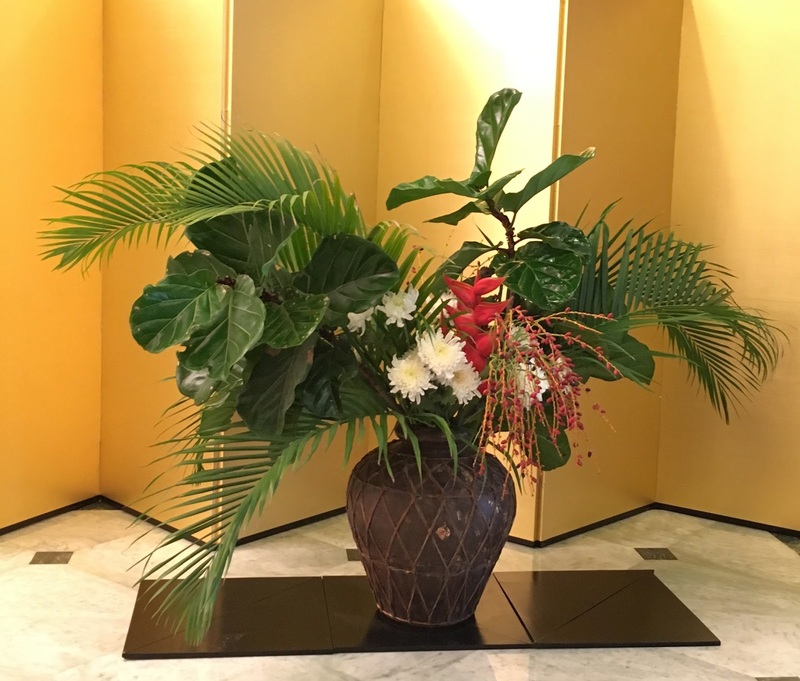 Sensei Dalley created a bold horizontal line with Sansevieria and a dry branch to balance the squat vase, with an exuberance of garden material in this low composition. 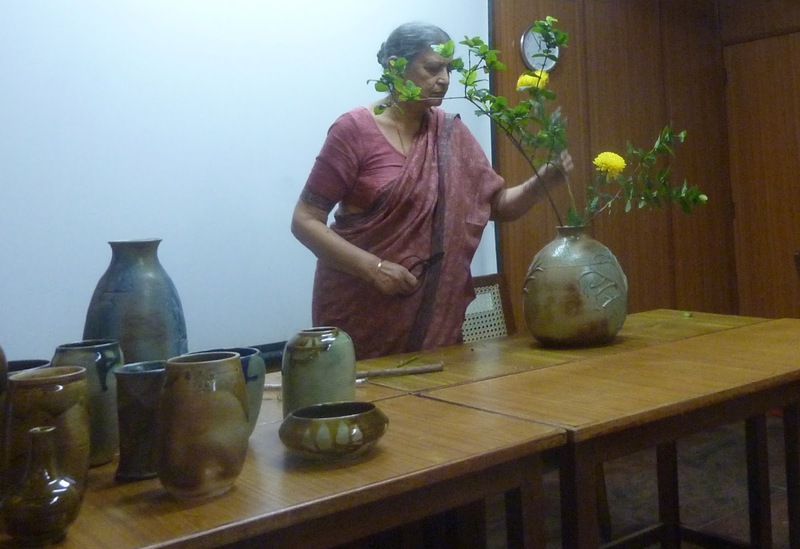 It was a morning well spent, and we are grateful to Sandhya for sharing her experiences with us and also hauling all the vases to display! 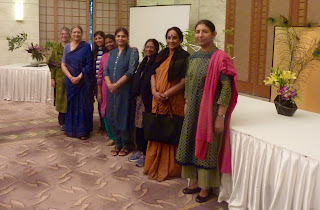 After refreshments courtesy Divya and Chelvi, we brought the workshop to a close.